Hasan Darwish, an international student in Industrial Engineering at UP, with his Busy Box. By thinking out of the box and exploring the idea to place business and community development in a box, an international student at UP studying industrial engineering has made it to a list of young movers and shakers on the continent. Hasan Darwis, a final-year student from Syria, was recently named one of the top 35 foreigners under the age of 35 who are making an impact in Africa. The list was compiled by the organisation Young People in International Affairs (YPIA) after nominations from all over the world were submitted. 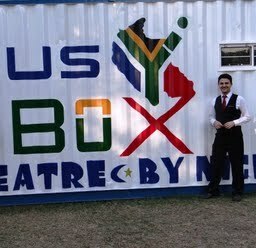 Hasan’s final-year product is called the Busy Box – a low-cost, prefabricated business in a shipping container. The self-contained unit is a classroom with virtual e-learning by day, but by night transforms into a movie theatre or venue for private booking. He envisaged it as a complete self-sustaining unit that is managed by an owner-operator. It is designed to be extremely affordable to run and provides services that were not previously available in low-income communities. Hasan explains that with the Busy Box, he offers the opportunity to teach children from rural communities in a tech-savvy environment. “The fact that the Busy Box serves both education and entertainment purposes, ensures community buy-in. The money earned from the movie theatre will also ensure the sustainability of the classroom. The 35 people on the YPIA’s list are all under 35, are not citizen’s from African countries and are excelling in their fields of expertise. They were chosen for the impact they make on African issues and international and because they are recognized by peers and the community as leaders or future leaders. Hasan’s nomination was in the category for Science and Technology. Over the past year, he has often addressed groups of learners about Engineering as a field of study. He is also very proud of the fact that the first Busy Box was erected in Soshanguve.